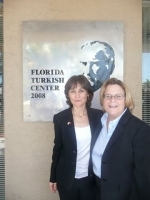 Florida representative Ms. Ileana Ros-Lehtinen visited our Turkish Center on March 26, 2010. She gave us a speech about Turkish USA relations, importance of grassroots activities and about keeping in contact with legislators. She also listened to the poems resided by Turkish children, watched and appreciated the paintings prepared by them. She tasted delicious Turkish food, which were prepared by volunteer Turkish ladies. Turkish community was very happy to have such visit.